A fun and modern t-shirt with a “fitted” look. A unique and fun short sleeve t-shirt that was part of Chris’ merchandising for special engagements in Hong Kong. Features simple, yet intriguing design on a super soft t-shirt. Only a limited number of shirts left. 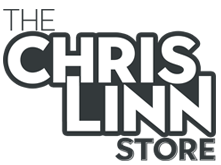 Screen printed “The Chris Linn Show” design on the front. No printing on the back. 100% ringspun cotton. Preshrunk. Fitted Look. Available in Adult Sizes: Small – XXL. This a fitted shirt. Sizes also tend to run towards the smaller side.